The mobile concrete plant is our latest design. The main characteristics of this mobile concrete Batching plant are: compact structure and easy transportation. Our mobile concrete plant adopts twin-shaft compulsory mixer, folding three-hopper burden machine. The main characteristics of our mobile concrete plant are unique car chassis design, multi-language windows operating interface, electricity gas water express plug, and high degree of automation, disassembly and convenient mobility. haomei portable concrete batching plant is fit for small and medium-sized projects. We can strengthen the integrated design of this series mobile concrete plant according to users’ requirements. We specialize in mobile concrete plant for high throughput rates up to 75cbm/h of compacted concrete. Production capacity of our mobile concrete plants is between 25 m3/h and 75 m3/h. Whether for temporary installation, special projects or permanent facilities, the mobile concrete plants by haomei Systems provide an economical and reliable solution. These mobile concrete mixing plant have the advantage of being deployed in just a matter of days. Dry batch and central mix plants are available in a variety of aggregate and cement storage configurations and batch sizes. Whenever space limitations, fast set-up or easy moving are concerned, a haomei mobile batch plant is the optimal solution. Among mixing plant manufacturers, haomei Machinery can provide the best concrete batching plant with reasonable price. haomei mobile concrete plant - We would like to highlight our mobile concrete plant and mobile concrete mixer with good quality and competitive price. A The mobile concrete plant is composed of material suppy, weighing, mixing and electric control system, with the optimized design of the concrete batching plant, it can be overall transferred and moved by the towing vehicle. It is widely used in larger than medium-sized mobile projects, like water and electricity, roads, airports, etc. B Hauling mobile concrete plant with running system is special construction concrete equipment designed independently by our company. It can be installed quickly on site. 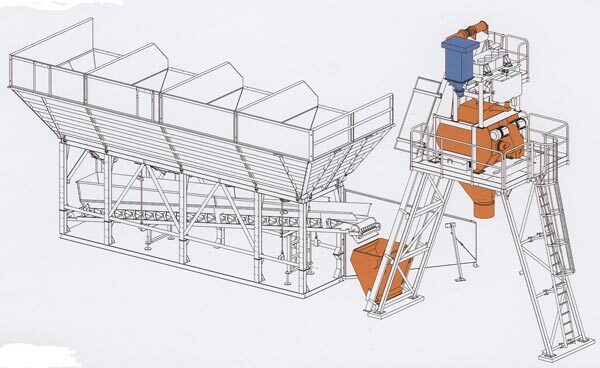 This mixing plant integrate mixer, batching system, running system, feeding system, weighing system, cement silo, screw conveyor and all the necessary equipment into together, installing on a transport chassis. mobile concrete plant of this model is a combination of storing, weighing, transporting, mixing and controlling. It has featured of compact structure and complete function. Ready to run without normal foundation and commissioning, which can save installation and commissioning time.